Free psychic palm reading. Do you have a psychic tip? Do You Have a Pointy Mercury Tip? A pointy Mercury is known as the "psychic tip". It reveals a person who is very idealistic and sensitive to all matters dealing with life, living beings, beauty, and spirituality. If your Mercury finger (your 'little finger') is tending toward being pointy, then you have excellent psychic abilities. You live in a world closer to the spiritual realm than the physical. The opposite would be indicated if your Mercury finger tended toward being square or spatulate shaped. If you have this pointy Mercury finger, you should avoid cold, rough, crude and noisy environments because you are very sensitive and your psychic senses will shut down. You will be numbed, and your sensitivity to the spiritual realms will be cut off. The best thing you can do for yourself is live and work where there is minimal noise, confusion and physical activity keeping you from relaxing. In order for you to use your psychic abilities you need to be where you can deeply relax, let your conscious mind slowdown, and just be an observer to each moment. It helps if you just pay attention to only how you are breathing. Notice nothing else. In this quiet mental state, the sensitive parts of your mind can better tap into the psychic realms. Meditation is an excellent way to quiet the conscious mind to arrive at the door to the psychic realm. While in this deeply relaxed state watch for spontaneous images or verbal messages. You may be very surprised at what happens! We all have spirit guides who help us if we listen to them with love and respect, just as they love and respect us. It takes only a very quiet and open mind to connect with our spirit guides to get guidance in the spiritual realm. With their help, time and space in the material world can be changed to produce miracles --as long as your intensions are good and loving. A pointy Mercury finger is the key to opening the door to the spiritual world most easily and effectively where daily miracles do happen. A conic tip indicates moderation in psychic, spiritual, and intimate relationships. 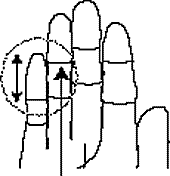 Most people have this conic fingertip. Most people with a conic Mercury tip do not have much interest in the psychic realms. However, if you are the rare person who does have psychic abilities and also has this conic shaped Mercury finger, your psychic abilities are very practical in everyday activities. For example, you will psychically know who is calling you when your phone rings. A square tip shows a practical approach to all matters psychic, spiritual, and intimate. If a person has other markings for psychic abilities, and has a square Mercury tip, then the psychic abilities will come in ways that are very practical and useful in daily life. A spatulate Mercury finger indicates high curiosity and this tip is often found on the hands of inventors. When the Mercury tip (double-headed arrow) reaches higher than the Apollo first joint line (the longer arrow), this is considered a really good condition. A long Mercury tip indicates a mind that is quick, sharp, and clever with abundant ideas. Combined with another psychic mark will ensure this person is ahead of the psychic competition.